Hathaway Brown School is pleased to host the 12th Annual performance of TAAL, a festive multicultural dance celebration of culture, family, and friends through some of the most beautiful forms of dance from around the world. This year’s program will take place on Friday, October 9, at 7:30 p.m. in The Ahuja Auditorium and feature a variety of dance forms, including Indian, West African, Flamenco, Hip Hop and more. A post-show reception will follow in the Anne Cutter Coburn Reception Room. The event is open to the public; tickets are $10 for adults, staff and faculty, and $5 for students and seniors. Reservations may be made at www.hb.edu/taal. 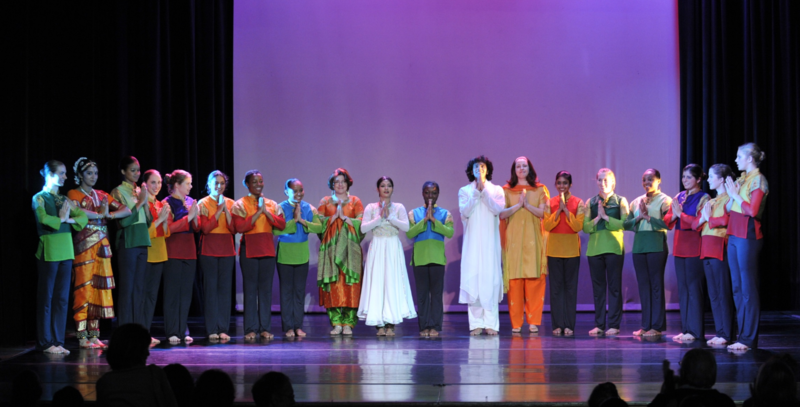 The TAAL program was conceived in 2003 by Preeti Gill, a 2005 graduate of Hathaway Brown, taking its name from the word used to describe the rhythmic patterns in Indian classical music. She developed the event as an Edna Dawley Strnad ’42 Fellow in Creativity, and it has been nurtured and curated by the Upper School Dance Department since that time. The program was launched to celebrate the culture of India and to honor the memory of Joti Sawhny ’92. Since its conception, TAAL has included various dance genres in celebration of cultural diversity. Proceeds benefit The Joti Sawhny Memorial Fund at HB, providing support for diversity-related programs and international dance trips. Headlining this year’s event is Azaguno, a colorful and vibrant multi-ethnic ensemble international touring group, which focuses on the research, preservation, education and performance of traditional African-American, Caribbean, and Latin American music and dance. The group was founded by Dr. Paschal Yao Younge, Associate Professor of Multicultural Music Education at Ohio University, and Dr. Zelma Badu-Younge, Associate Professor of Dance at Ohio University. Pooja Kumar Shyam is an internationally renowned professional Bharathanatyam dancer. Through picturesque sculpted lines, she brings grace, poise, and vibrancy into her performance. Pooja has had training from illustrious gurus from Chennai, India, and she has been presenting thematic concerts, collaborative presentations, innovative workshops, and lecture demonstrations to enlighten others with this art form. Pooja is also a dedicated teacher who takes pride in focusing on the details and emphasizing perfection and quality, bringing out the best in each and every student. She directs her dance school Nrithyapooja Dance Academy on the east and west side of Cleveland, Ohio. A dance film featuring Teena Marie Custer, a dancer, teacher, and choreographer based in Pittsburgh, performing and battling internationally with her all-female street dance crew, Venus Fly Trap, as well as her local Pittsburgh crew, Get Down Gang. Her hip-hop dance theater work has been presented at Sadler's Wells Theater in London, The American Dance Festival, Kelly-Strayhorn Theater, Ford Amphitheater in Los Angeles, and the American College Dance Festival Gala Concert. She has also created hip-hop dance theater works for more than 20 university dance departments around the U.S., and has appeared on BET, MTV's “MADE,” and was also a featured dancer and assistant choreographer for the feature film"Leading Ladies." Teena Marie earned a BA in Dance from Slippery Rock University and an MFA in Dance Performance from The Ohio State University. She is also on faculty at the American Dance Festival at Duke University. Contemporary Dance Ensemble, who had the honor of learning from Talise A. Campbell. Campbell is a graduate of Cleveland School of the Arts, having completed double majors in Dance and Drama. She has studied with the likes of Marie Basse-Wiles, Babacar N’Diaye, Assane Konte, Mouminatou Camara, Tacko Cissoko, Bill Wade, Diene Sagna, Kissima Diabate, and Baba Chuck Davis. Currently, Campbell teaches at the Cleveland School of Arts, Case Western Reserve University, Cuyahoga Community College, and more. She is the Artistic Director of Djapo Cultural Arts Institute, where her mission is to preserve the traditional arts of Africa and throughout the Diaspora. Campbell will receive her doctoral degree in Urban Education, researching the effects of arts integration, culture, and socio-economic status on achievement, making comparisons with students in Dakar, Senegal with students in urban settings in America. Cuban performer Griset Damas Roche is a Soloist of Ballet Español de La Habana and Director of Ballet Caña Flamenca and Compañia Flamenca Griset Damas. She possesses years of experience as a Flamenco and Ballet teacher and has choreographed more than 15 shows. Roche is the winner of five International Dance Awards in Bogota, Colombia and is a guest star for the Philharmonic Orchestra of Bogota, Symphonic Orchestra of Colombia, and Antonio Canales´s Show “Bolero.” She resides in Columbus, Ohio. Mansee Singhi, a native of India and member of the United Nations International Council of Dance, is a trained and accomplished Kathak dancer specializing in the Lucknow and Jaipur Gharanas. Her talent was crafted and refined under the guidance of renowned Kathak Guru – Smt. Asha Joglekar and she has also trained with other leading gurus of India such as Guru Shila Mehta and Guru Archana Joglekar. Since the age of 7, she has showcased her talent at various International festivals representing the country and has performed in several dance and cultural exchanges in India, Malaysia, Singapore, and the US. She has choreographed various dance pieces and has been invited to conduct educational workshops and demonstrations. Singhi also performs the Ghoomar, a traditional folk dance from Rajasthan, India. For more information and to purchase tickets, visit hb.edu/taal. Questions about TAAL: please contact Falon Baltzell, Director of Upper School Dance, (216) 320-8796 x. 7166 or fbaltzell@hb.edu. Founded in 1876 and located in Shaker Heights, Hathaway Brown is Ohio’s oldest continuously operating school for girls. HB’s inclusive environment, outstanding faculty, and signature programs draw families from 80 Northeast Ohio cities and towns. Immersive academic, service, and cultural opportunities abound, and graduates attend many of the country’s top universities. The school provides an exceptional education to girls in K-12, and in the co-ed Early Childhood Program. Financial aid, merit scholarships, and transportation are available. Visit www.hb.edu to learn more.